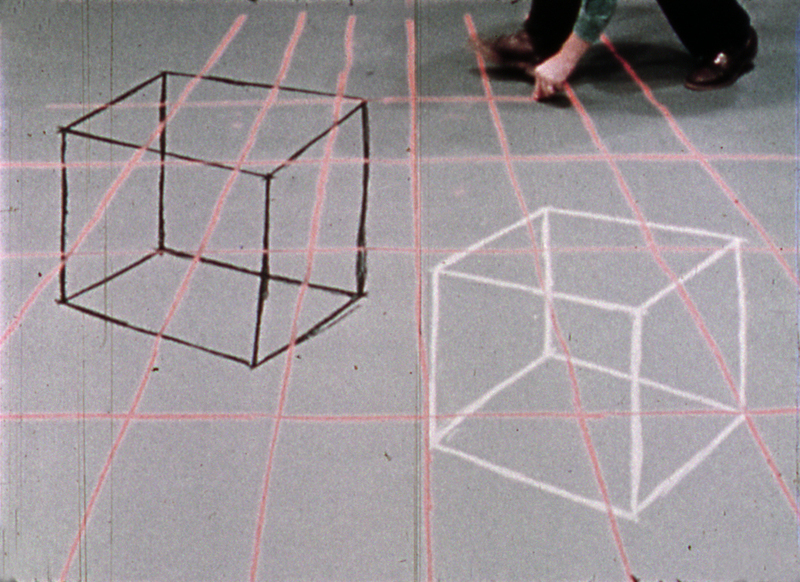 The restoration of David Haxton’s Cube and Room Drawings (1977) is one of the very few in which I’ve actually cut a filmmaker’s original. In this case, the camera original is not the same as the “original” conformed printing master for the finished film, which was lost. But the presence of the camera original footage for the film enabled me to restore it using some atypical approaches in printing and restoration. 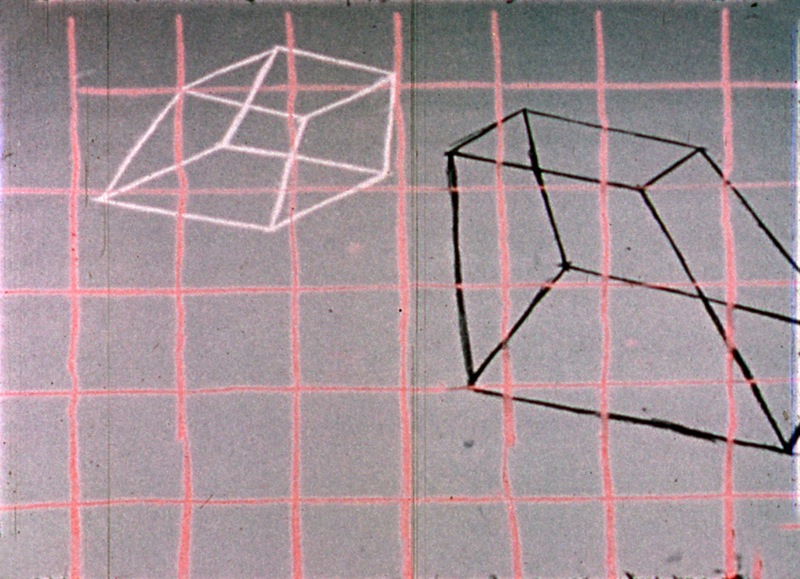 Cube and Room Drawings was shot entirely on 7242 Ektachrome EFB. 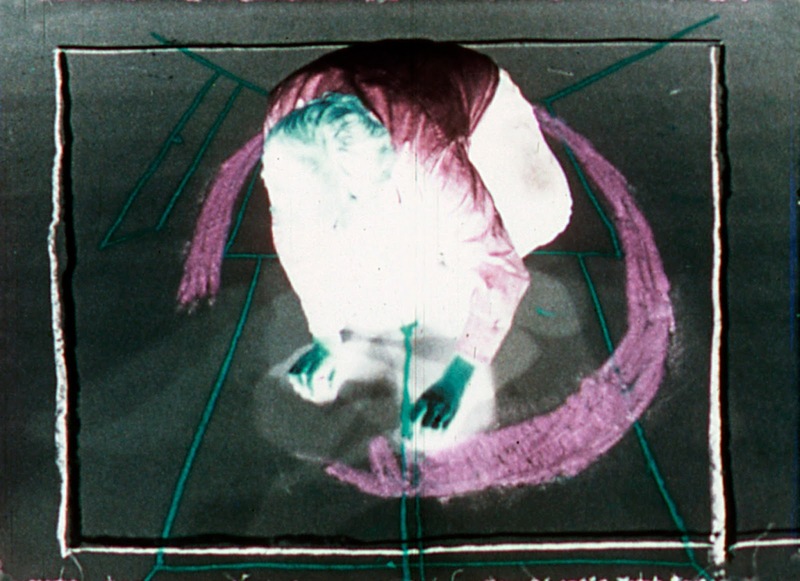 David Haxton frequently made use of negative imagery in his films (i.e. 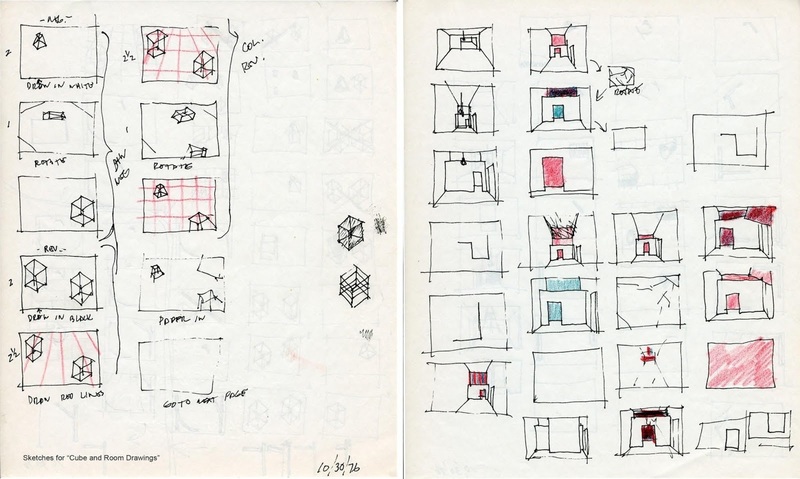 the image has negative polarity in the finished prints), and Cube and Room Drawings is no exception. The film begins in negative (~100ft. ), switches to positive (~300ft.) and then concludes back in negative (~100ft.). The sense of action is continuous from beginning to end, and in fact it was more or less shot in a single session, with breaks only to reload the camera, or stop it briefly during some dead time in the execution of the filmed performance. As mentioned, the entire film was shot on 7242 Ektachrome EFB, yielding a positive image on the original. The camera original was separated into three parts, corresponding to the above description. In the finished film, Parts 1 and 3 are intended to be seen in negative, and Part 2 is seen in positive. The B-wind reversal camera original for Parts 1 and 3 were contact printed – as if negative – to 7381 color print stock, yielding an A-wind color print with negative polarity. Part 2 was contact printed conventionally to a color reversal print stock of unknown type (likely Eastman 7389, 7390, or Agfa), yielding an A-wind color reversal print with positive polarity. Part 2 was also trimmed at its head and tail, and edited slightly in three places to trim out unwanted excess material, such as some dead time or a flash frame when the camera was stopped at a few points. These edits were done with tape splices. The negative prints for Parts 1 and 3 were trimmed at head and tail and tape spliced to the beginning and end, respectively, of Part 2, completing its negative-positive-negative form. This yielded a complete A-wind picture roll, an A-roll only, representing the finished, conformed printing master for the film. Color reversal prints were then struck from this A-wind printing master. The two extant prints I have access to are both B-wind Agfa color reversal prints. It’s possible David also printed to Eastman 7389 (or, less likely, 7390 or 7387), but I have no confirmation of that. Sometime in the years following the cessation of his filmmaking (ca.1982), the originals for nearly all of David’s films were lost, presumably discarded by the lab where they had been stored. 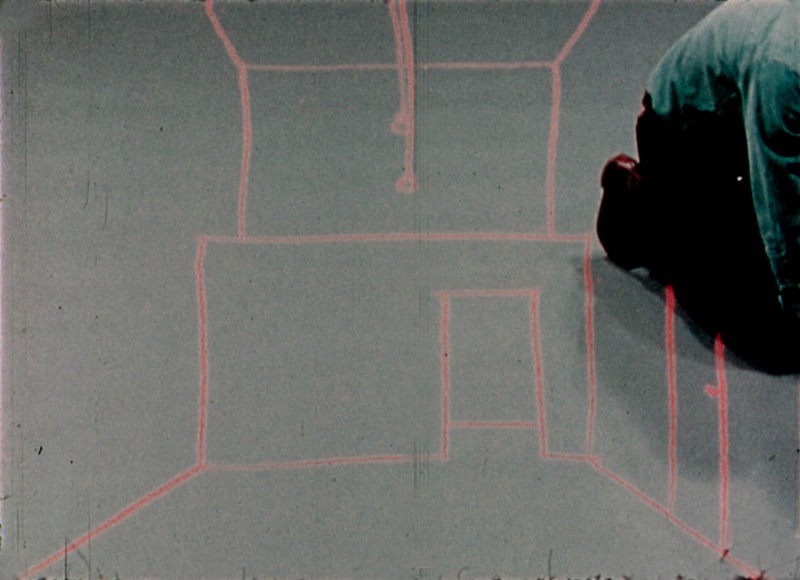 However, although the functional, conformed printing master for Cube and Room Drawings was among the material lost, the raw Ektachrome camera original material still existed in David’s possession, unexpectedly enabling me to restore the film using the camera original. To do so, I needed to replicate the steps done by David in the creation of his printing master, though with reversal printing stocks no longer available, some modifications in the process had to be made. Parts 1 and 3 of the camera original, still in separate rolls, were spliced together leader-to-leader, to be more easily printed together. Parts 1 and 3 were then contact printed as if negative to an A-wind 3383 color print, to achieve a print with negative polarity. This was done as a way to work out the timing lights needed to produce a negative print with good color/density. Although somewhat faded, one of the vintage Agfa reversal prints was used as a general guide for timing. Once this was approved, Parts 1 and 3 were printed again, but this time optically, so the image orientation could be flipped, resulting in a negative print with the necessary B-wind emulsion position. This was returned to me. Using the same vintage Agfa print (which conveniently had edge numbers printed through two generations from the camera original) as a reference, I set the various parts up on the bench, and built a set of A/B printing rolls, using a combination of the newly produced negative prints for Parts 1 and 3 and the Ektachrome camera original for Part 2. All three parts were now in the correct polarity (neg/pos/neg), and wind (all B-wind). I could have assembled them as an A-roll only, with tape splices, as David had in 1977, but was concerned that the mix of polyester (3383) and acetate (7242) material might cause some printing instability. Instead, I composed the material as A/B rolls, with Parts 1 and 3 in the A-roll and part 2 in the B-roll. To save on the black leader (which is expensive), I used clear leader as the slug in both rolls, with the exception of a foot of black before and after the A/B switches, with 16-frame fades to open/close the fader leading into and following these points. As mentioned earlier, in winding through the material in a synchronizer with the reference print, I also discovered the camera original for Part 2 needed an extra bit of conforming in five places. These were the aforementioned edits David had made when originally assembling his printing master. Using tape splices as he had, I trimmed the head and tail, and made the three necessary trims throughout Part 2, which was easier to do given the presence of the edge numbers in the reference print. The conforming for Parts 1 and 3 was done by sight, as there were no edge numbers to go by. I remember seeing a Haxton film at the Whitney in the 70's- it was in negative and proposed some astounding spatial illusions. I'm not sure this was the film- the title is lost to me- but I'm glad his work is being preserved. It left an indelible imprint.